One of the biggest questions new parents have is when to introduce different types of solid foods. 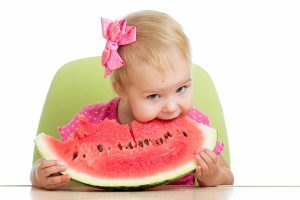 As specialists in feeding, speech and language, Integrated Children’s Therapy (ICT) has a simple approach: When your baby reaches new gross motor milestones (like sitting up, crawling, or walking) that’s your cue to introduce new types of food. This is because your baby’s oral motor skills (like biting, chewing, and swallowing) develop alongside his gross motor skills. When he’s ready to do something new with his body, he’s also ready to do something new with his mouth. According to ICT co-founder Mandy Alvarez and one of their speech language pathologists, Chris Rowlee, introducing solid foods either too early or too late can lead to food aversions, obesity and other health problems, and speech-language delays. By introducing foods at the right times, you can avoid these problems and set your baby up for a lifetime of healthy eating. Here’s more information about how three gross motor milestones relate to feeding and speech, and how you can set your baby up for success! We recommend that unless your baby has a medical issue (like reflux), you stick with breast milk, formula, or a combination of the two until your baby can hold his head up and sit with little to no support. This typically occurs around 6 months of age. As your baby begins to control his head and sit up, his larynx (voice box) lowers, his cheeks thin out, and his body becomes stronger and more mobile. All of this leads to the jaw stability and tongue movement required to eat purees from a spoon. The body and mouth movements that develop with sitting and eating purees prepare your baby to babble. Your baby will begin to make lip sounds like “ba-ba” and “ma-ma”, and tongue sounds like“da-da”. To optimize oral motor development and encourage your baby to eat new things, try making your own pureed food. This will give the food more texture and different tastes, as store-bought purees tend to be very finely pureed and similar-tasting. We get it that this can be time consuming! As an alternative, try mashing up a banana or avocado and adding it to store-bought purees. The left-right movements of crawling are also happening with your baby’s jaw, tongue and lips, so when he begins crawling he is ready for soft foods that he can bite and chew. Try pieces of cooked vegetables, soft fruits, or pasta. As a bonus, when you give your baby these foods on a tray or plate and encourage him to eat with his fingers, he is using his thumb and first fingers in what’s known as the pincer grasp. This fine motor skill will be crucial later on for skills like holding utensils, crayons, and pencils. The coordination and strength involved in biting and chewing help your baby make more complicated speech sounds. Babbling will now have different combinations of sounds (da-gee-da). Let your baby get messy! Imagine if someone was constantly wiping your face and hands with a wet cloth during a meal. You’d probably get turned off by the whole experience! Babies learn through curiosity, so we say let them smush food between their fingers, get it on their faces, and rub it around the tray or plate. This sends the message that eating is a pleasurable experience and encourages them to try different things. Walking brings in increased up-down, left-right, and side-to-side movements, which lead to a more controlled ability to bite and chew. Your baby can now begin to handle a variety of textures, like harder vegetables, cubed fruits, cheese, and soft meats. When your baby’s jaws, tongue and lips are coordinated enough for more complicated biting and chewing, more complex speech will emerge, like jargon (making sounds that imitate adult speech) and his first true words. Allow your baby to feed himself. At this stage he might become interested in using a utensil, but if not it’s okay to let him eat with his hands. It’s important for him to control both the amount of food he eats and how fast he eats it. We also encourage creative eating at this age; if he wants to scoop up food with a cracker instead of a spoon, or if he wants to use a spoon backwards, let him go for it! Babies that learn to feed themselves typically become better feeders for life. In addition to following this approach, you can find a variety of exercises on the BabySparks app designed to help you introduce solid foods to your baby and encourage him to feed himself. Integrated Children’s Therapy is a pediatric speech and occupational therapy practice in Miami, FL. ICT provides individual and group therapy for speech, language, feeding and sensory-motor issues – all with a special emphasis on social communication development.